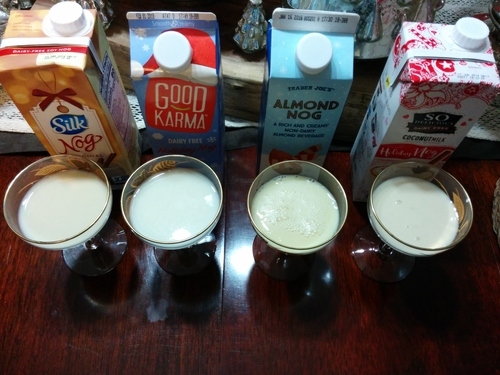 A few years ago I did a taste test of the various nogs available at the time. I still have bad memories regarding the rice nog. After seeing so many new varieties available this year I thought it would be time to do another test. 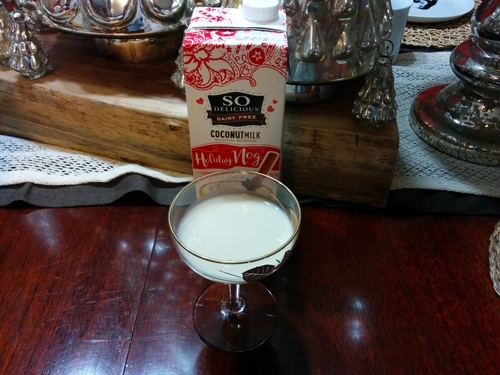 Now, nog, or egg nog as you know it by traditionally, is not everyone’s thing. I have always enjoyed it. As a wee kid I would drink glasses of it. The non-vegan stuff isn’t light on the fat or cholesterol, it does have egg in it, after all. 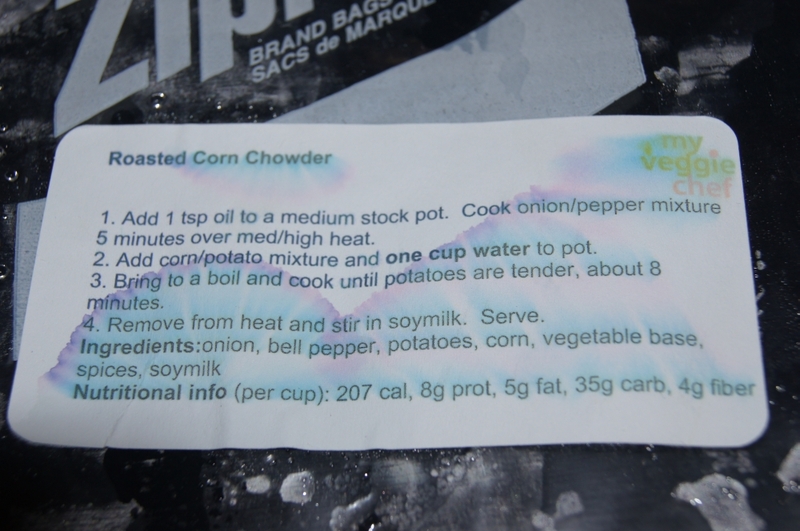 My grandfather always preferred boiled custard which I felt was just the same as egg nog without the spices. 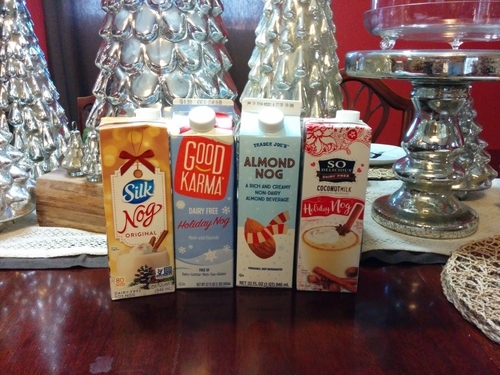 I have not found a vegan boiled custard but have run across a few varieties of nog. I have chosen four for this article, one from each of the more popular bases: soy, almond, coconut and flax. OK, flax isn’t that popular and has a relatively small shelf footprint but the other choice was rice and I wasn’t going to go through that again. Rice nog is terrible. Cut the chase, there’s your answer. So as I’m not the only opinion you’ll get on these nogs, I enlised the tastebuds of the kid. The kid is my 12 year old daughter. She’s picky. 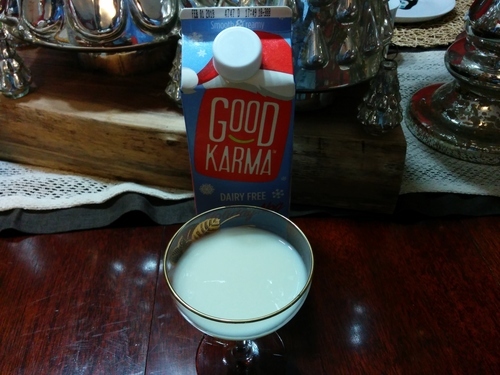 The nog’s are Silk’s Nog that is always a staple in the non-dairy section this time of year, So Delicious Coconut Nog, Trader Joe’s Almond Nog and Good Karma Flax Nog. Lined up, and poured into glasses, the sipping was on. The Kid: This is good. The Kid: I don’t like this one. The Kid: This doesn’t taste right. 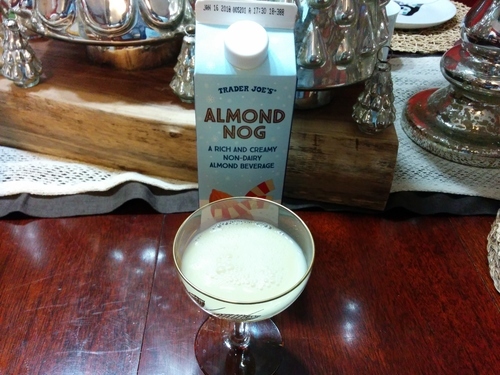 If you have found a nog that I didn’t try let me know. Next year I’ll try to add it to my drinking list. 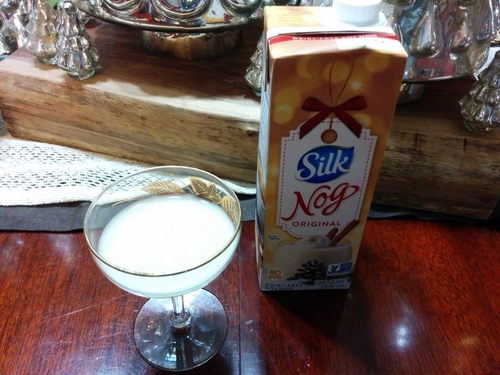 I hope your holidays are happy and full of a good nog! Anyone who knows me knows my love for barbecue. As a vegan I still love barbecue. You don’t have to use pork, beef or chicken to get the smoky goodness of barbecue. As a matter of fact, for me it is all about the sauce. I just need a form of transport for the sauce and sometimes that’s a simple as a spoon. 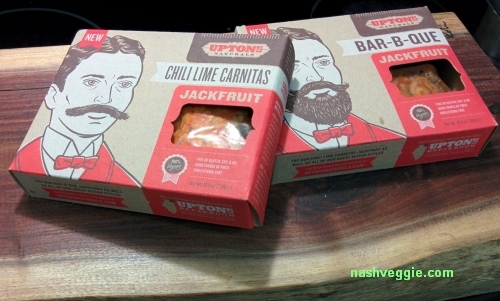 However, being the barbecue lover as I am I was excited to try Upton’s Naturals Jackfruit. 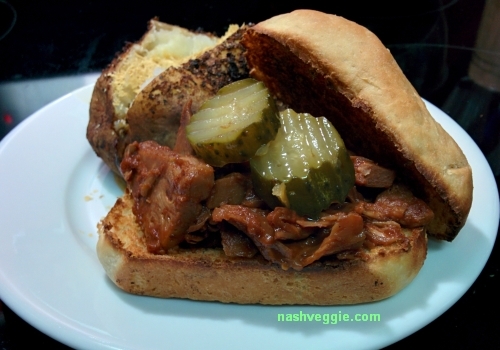 I had tried a barbecue jackfruit sandwich once before at Native Foods and we seriously underwhelmed but I believe it had more to do with the fact I had paid $10 for a sandwich that had 2 small pieces of jackfruit and was nearly flavorless. Jackfruit has recently elevated itself as the new vegan meat replacement of choice among the vegans who like meat replacements. It has a chewy texture and a stringy form when unripe that much resembles pulled pork or beef. 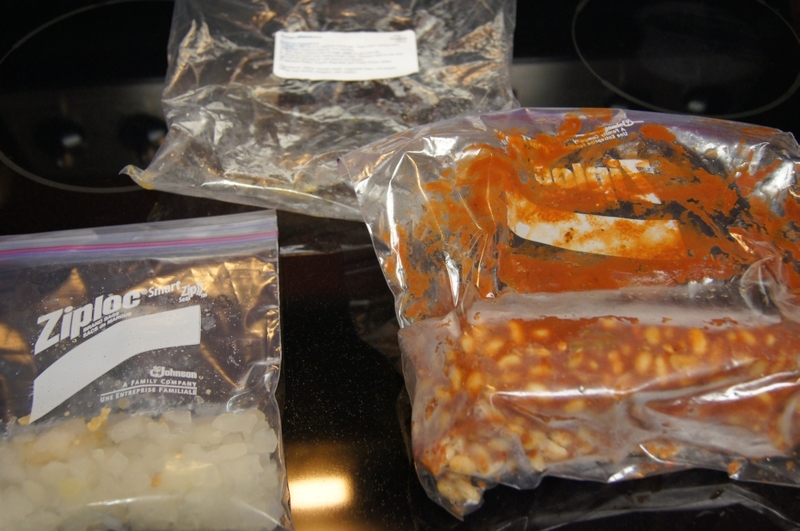 Add that to barbecue sauce and you have what could be a nice sandwich for some. Upton’s Naturals is a Chicago based natural food producer. Their products consist of seitan and now they have added jackfruit to their line. The jackfruit from Upton’s Naturals is available in Bar-B-Que and Chili Lime Carnitas. I tried both. 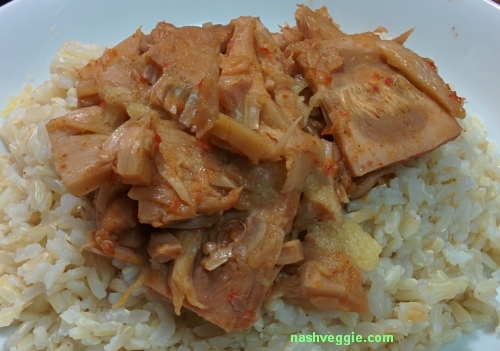 I prepared the Bar-B-Que jackfruit on stovetop. 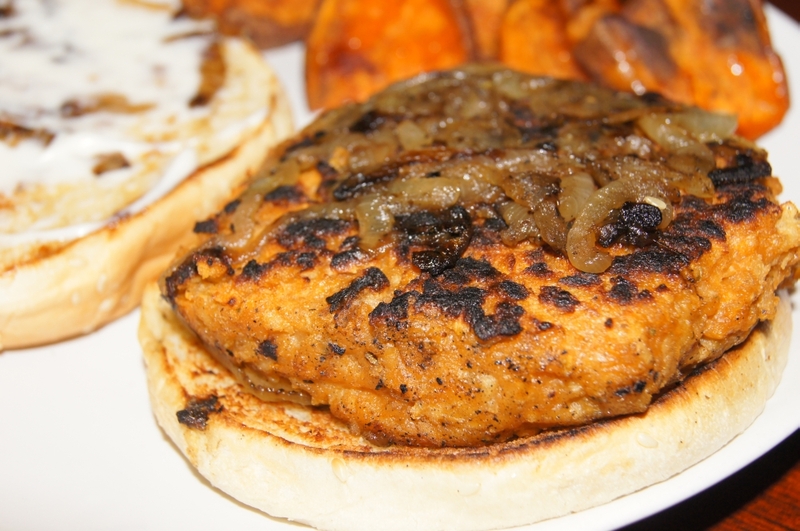 I heated it slowly in a pan, covered and served it on a freshly baked bun with sweet pickles. On the first bite I felt something was off. 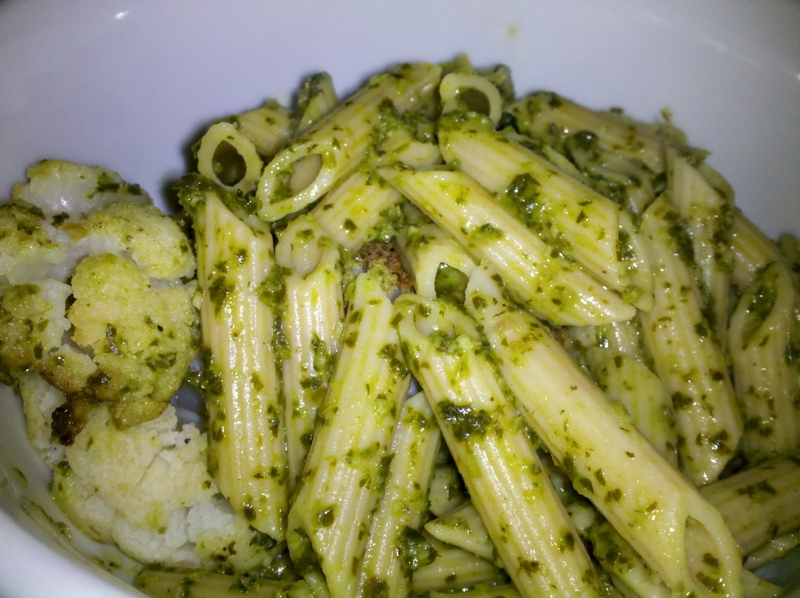 The flavor was very vinegary. 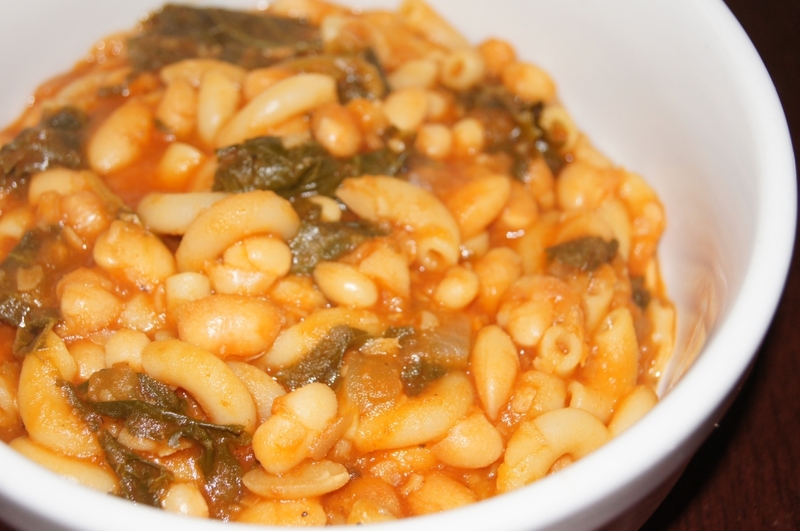 There was no smokiness or sweetness to the sauce. The flavor of the jackfruit was there in a fruity way but the sweetness of the barbecue sauce which should always be noticeable in a good barbecue sauce was completely missing. I trudged through the rest of the sandwich but was left very underwhelmed. I think this product could benefit from a reworking of the sauce that it is served with. Upton’s Naturals BBQ Jackfruit sandwich. 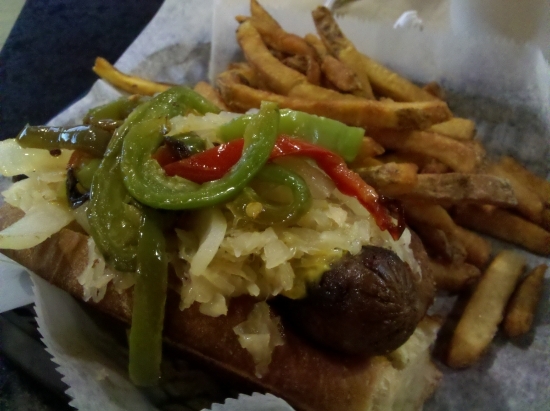 Served with sweet pickles on a fresh baked bun. The Chili Lime Carnitas Jackfruit is similar in form to the Bar-B-Que Jackfruit. I prepared it the same as the Bar-B-Que and serve it with black beans and rice. Upon the first bite I noticed the same acidity present in the Bar-B-Que Jackfruit. There was no lime flavor at all. 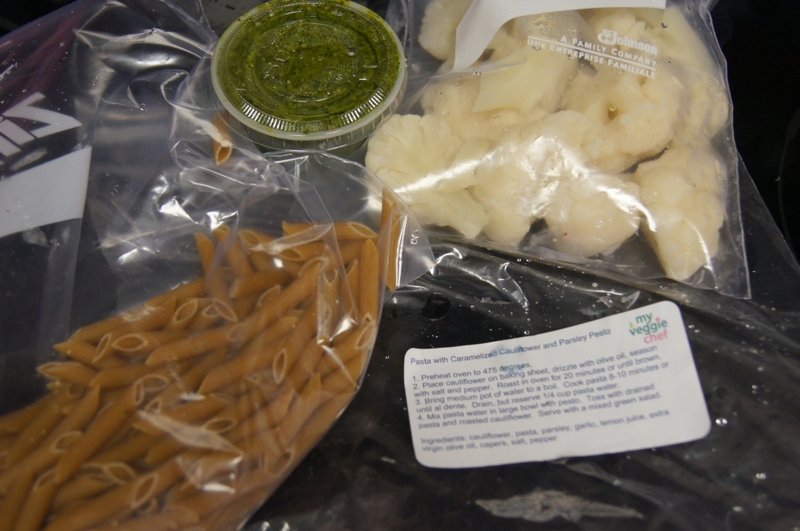 There was no spice or flavoring to the sauce or jackfruit other than the acidic sauce. There was a distinct fruit flavor to the jackfruit that was entirely out of place as though the jackfruit had been overripe. I had beans and rice for dinner this night and the jackfruit went uneaten. Upton’s Naturals Chili Lime Carnitas Jackfruit served over rice. 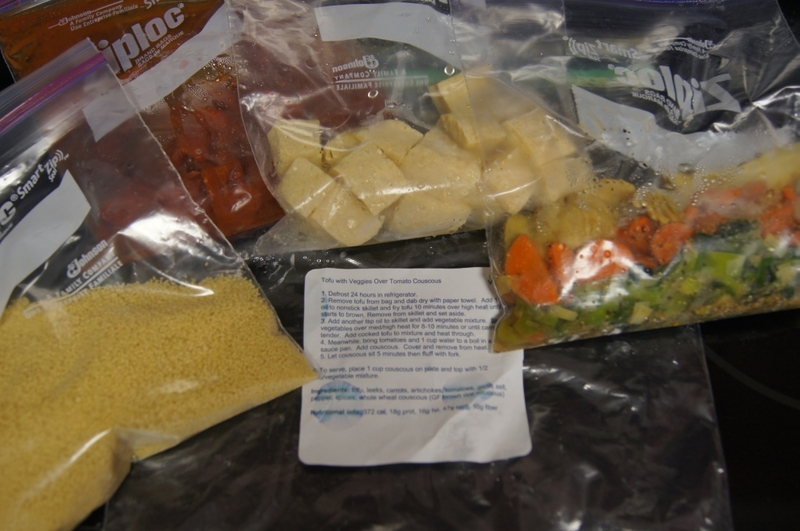 If you are a jackfruit fan these two products may be for you. I am not certain of whether these are not good products or I’m just not a fan of jackfruit but I honestly think the issue lies in the sauce and spices used with the jackfruit. If you’re up for trying your own and forming an opinion for yourself both varieties of jackfruit as well as seitan from Upton’s Naturals is available from Vegan Essentials and other locations. At the time of this article, Whole Foods in the Nashville area does not stock the jackfruit. People look at me odd when I tell them we vacation for food. It’s true. 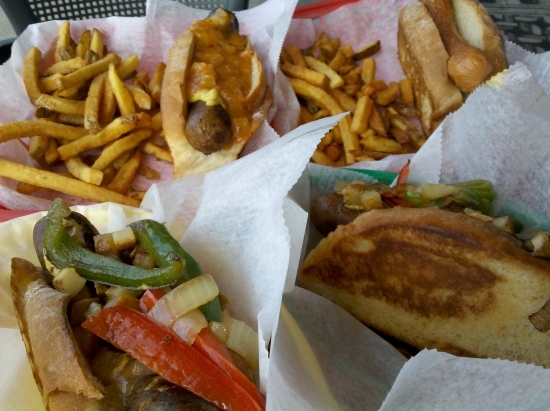 We always pick a destination based on availability of vegan eats. This is why Denver, Portland and New York City are regularly at the top of our vacation list. Most people head to the beach but I’ll head to the vegan barbecue. This is not a Nashville post. You can think of it as a wishful thinking Nashville post. 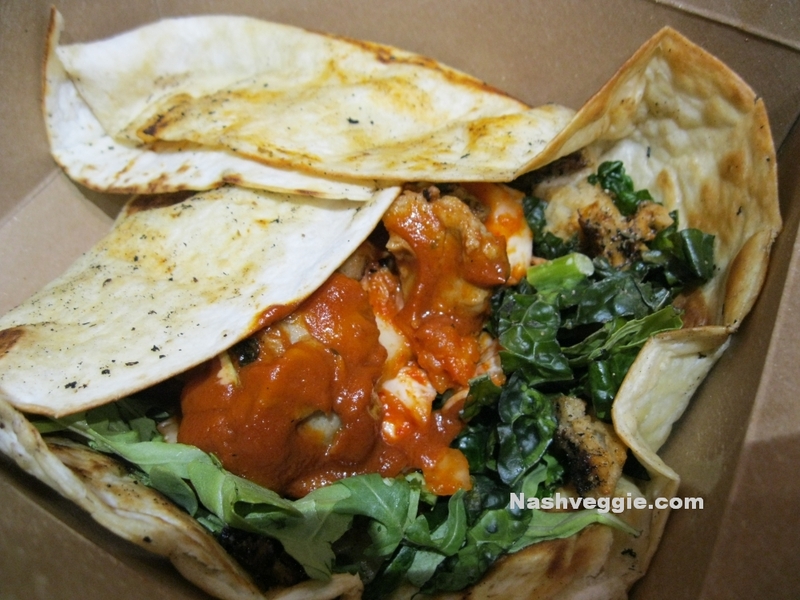 Nashville doesn’t have a vegan food truck. 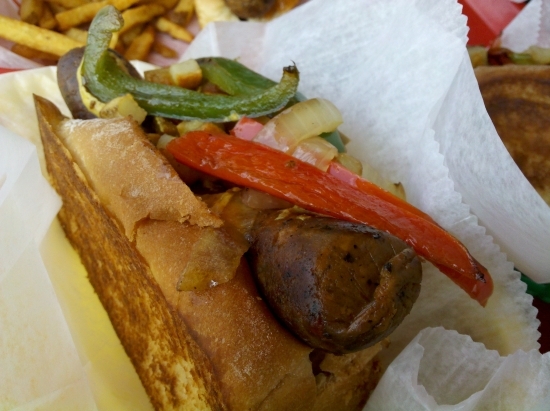 In fact, a discussion I had once with a very popular Nashville food truck over adding a single vegan item to their menu was met with a “Why would anyone want to eat that?” Unfortunately, that pretty much sums up the mentality over vegan food when you mention it to most restauranteurs in this area. I wonder, why would anyone want to eat decaying animal flesh or pus-filled, molded cow secretions? But I digress. Suffice it to say that food truck will get no attention from me. On we go to the big city. The land of towering buildings. The streets filled with food and many of them vegan choices! 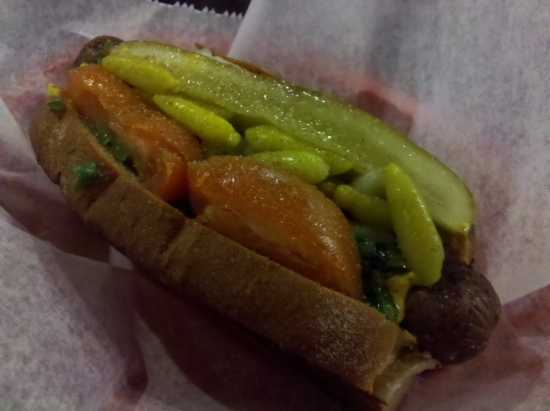 When I discovered New York City was home to a vegan food truck I was honestly excited. The thrill of the hunt! Would we be in the same area on as The Cinnamon Snail on a given day or would we be hitting the train to search out this animal-free street runner? 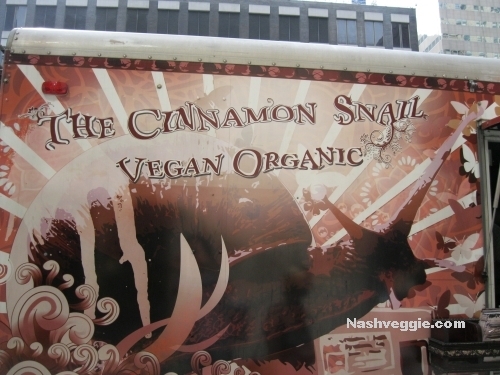 It didn’t take long to discover via The Cinnamon Snail’s Twitter feed that they would park just 2 blocks from our hotel every Tuesday. Perfect for a quick breakfast bite before hitting the city. The window prominently placed in the front of The Cinnamon Snail displaying the delicious vegan sweets. 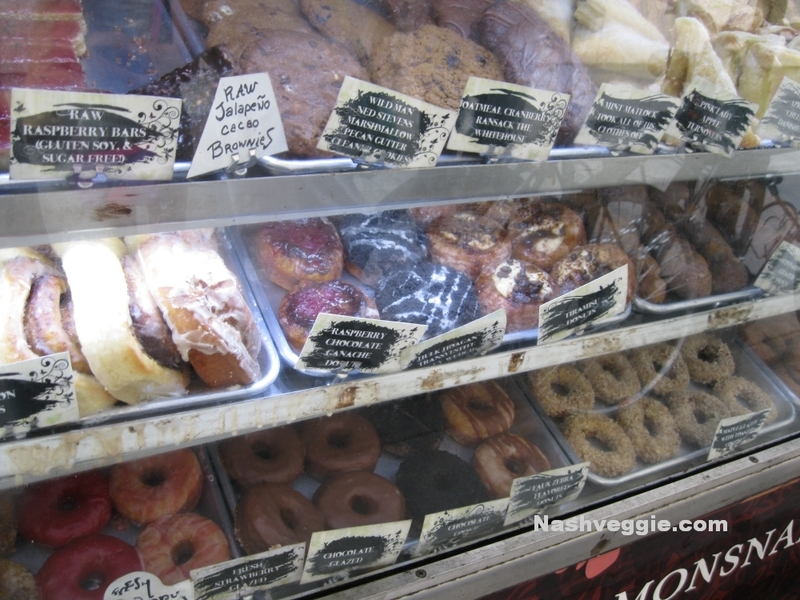 The sweets window - If raw is your thing, you have choices on the top shelf. Owner/Chef Adam Sobel (Right) and crew. Don't let them freak you out. 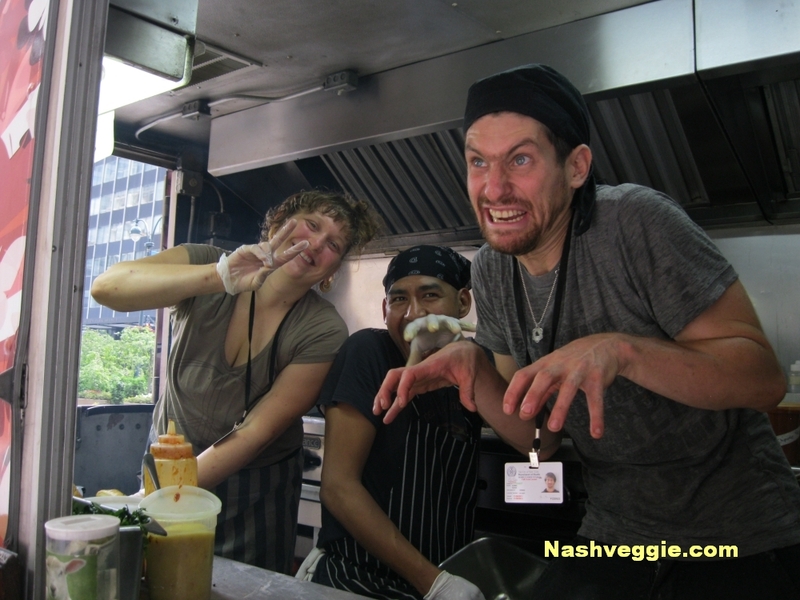 Always a smile and these guys can whip out some mean vegan vittles! Based on our first visit to The Cinnamon Snail we deemed it necessary to visit again. Not many places will get a second visit from us on vacation but The Cinnamon Snail proved well on our first encounter and sounded good a few days later. This time we found them to be on Wall Street for the day so we hopped the train for a trip to the Financial District. 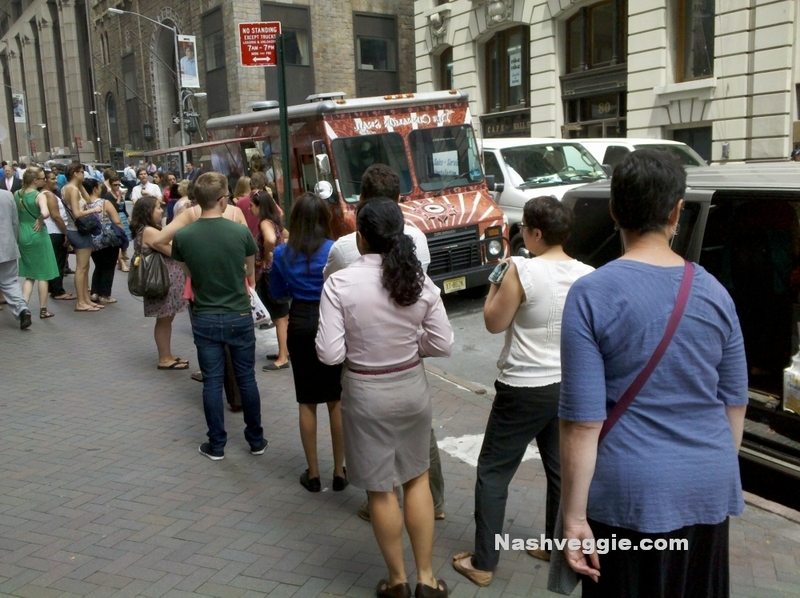 We walked a few blocks down Wall Street passing other food trucks setup in hopes of grabbing the monetary swingers on their lunch breaks. A person waiting at one, another waiting for customers and most just waiting with no one ordering yet. It wasn’t hard to find The Cinnamon Snail. There was already a good line formed for the vegan eats. In fact, they had the only line out of the other trucks we passed on the way. This time it was lunch. 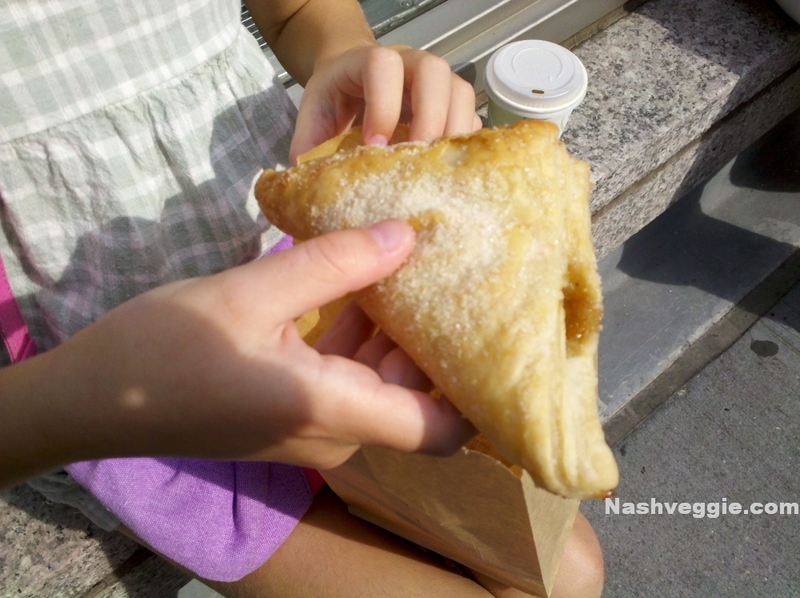 We needed street-walking sustenance. Looking at the menu we chose what sounded to be delicious, I the Korean BBQ Seitan and Mrs. Nashveggie the Maple Mustard Tempeh Sandwich. 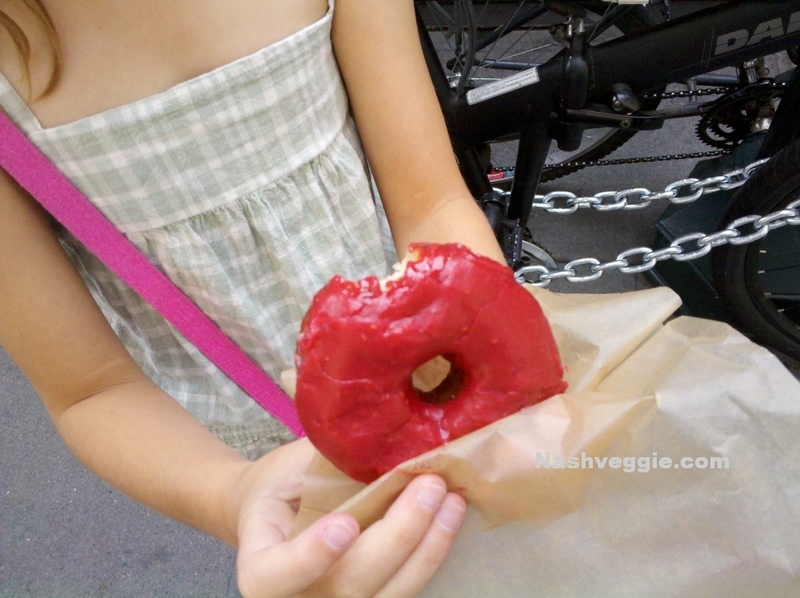 The kid wanted another doughnut which was fine knowing she could share some of our non-sweet vittles. We found a public area at nearby Deutsche Bank and broke into our boxes. At first sight I was wishing I had went with Mrs. Nashveggie’s choice as my BBQ looked on the small side. I was wrong. Once I took a bite I realized the tortilla was stuffed full and also full of flavor. This thing was delicious. 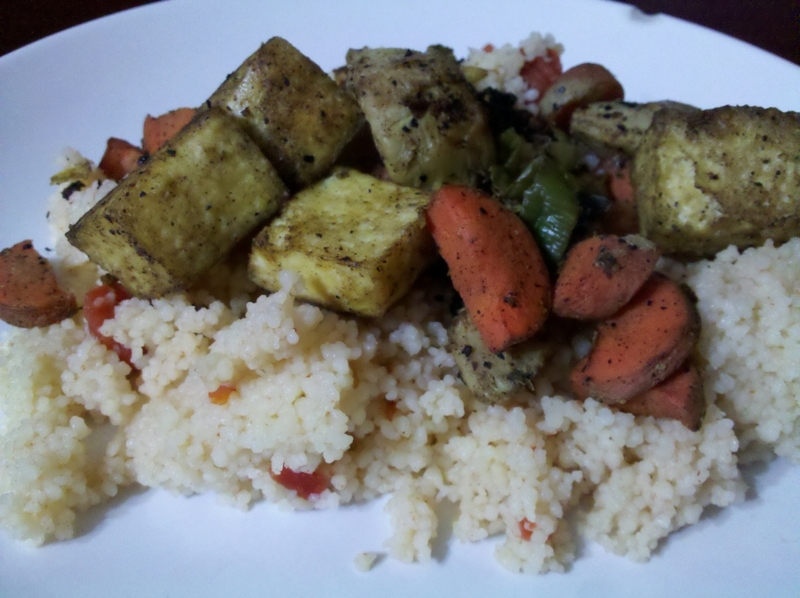 I also tried the Maple Mustard Tempeh and I can understand why it is one of their most popular menu items. Delicious! The Korean BBQ Seitan was full of seitan chunks. 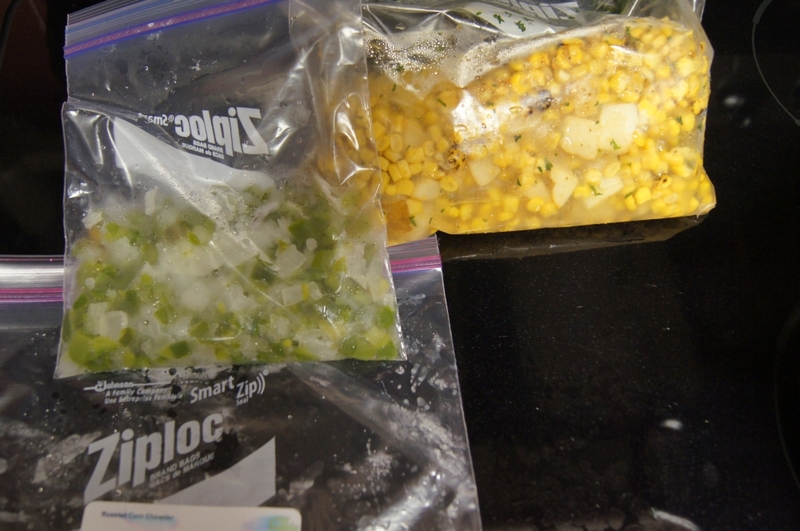 They’re unseasoned when prepared it seems but made so they can take on the flavor of the item the make with them. 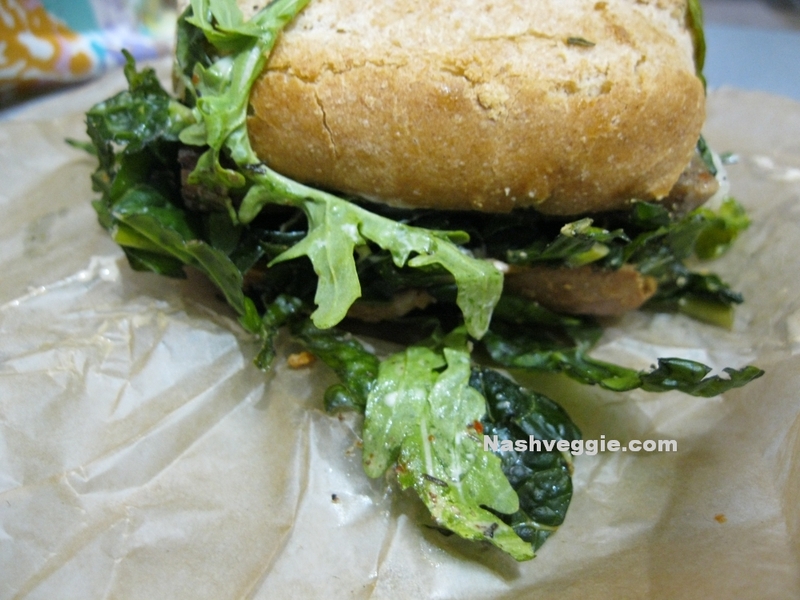 There was lightly steamed kale in there with a very spicy sauce that didn’t overpower the sandwich. 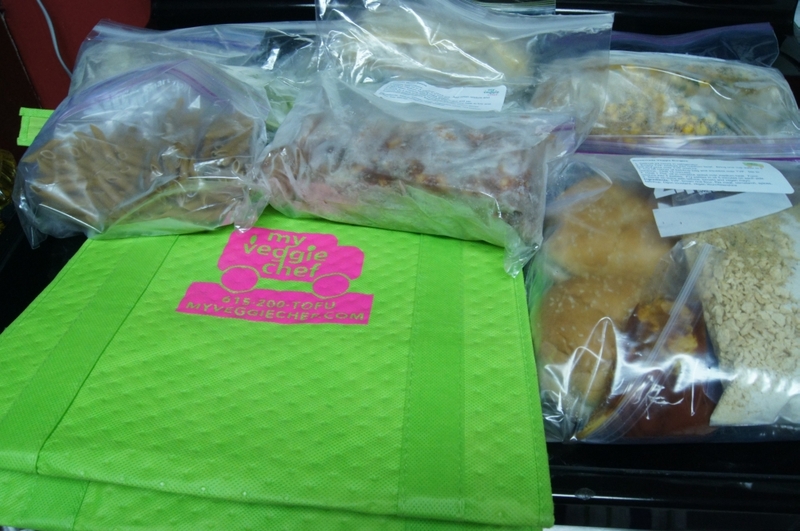 A great lunch for the three of us and just under $20 including the doughnuts the kid wanted. This is a deal in Manhattan. After devouring our lunch we thought about a doughnut to-go. To-go being an odd term to use when grabbing one from a food truck. Back to the truck I went and discovered the line was 24 people deep and a bit slow moving. I waited in line for a few minutes. 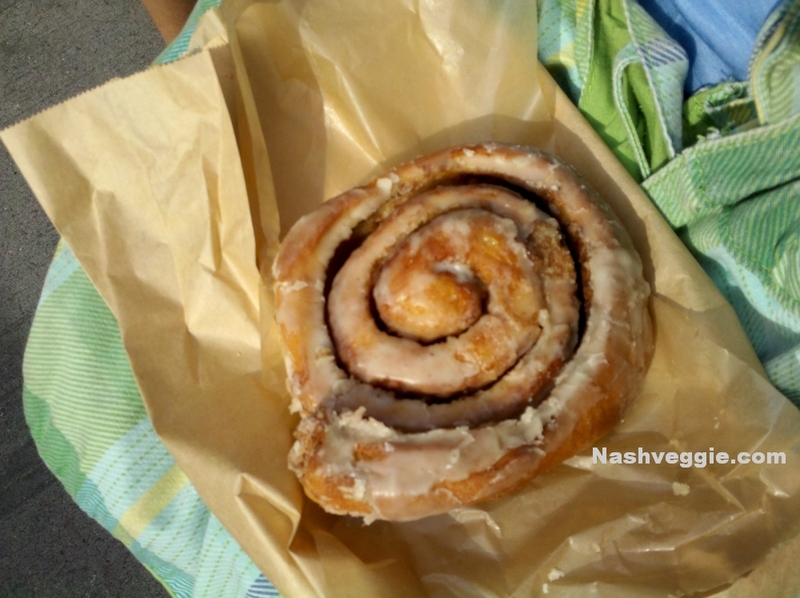 While waiting a few people passed The Cinnamon Snail, took a look in the direction and said “Oh, that’s just sweets.” or “They only have pastries.” This is probably because of the 1. The name. 2. The window beneath the ordering area that displays all of their pastries and doughnuts, the only food display window. 3. The absence of anything announcing anything not sweet anywhere on the truck that would be visible to distant passers-by and “Cinnamon” emblazoned in huge letters, a word most people relate to sweets. Granted, they had a long line so most people are aware they serve savory goods but it seems they could get more with adding perhaps an image of a sandwich somewhere or even a specials board in plain sight on the side of the truck stating something like “TODAY’S VEGAN HOTNESS: MAPLE MUSTARD TEMPEH SANDWICH! SAVORY GOODNESS!” Since the line was very slow to move I decided a doughnut was not going to be had as we had many things on tap for the day and we had to get to the next stop. 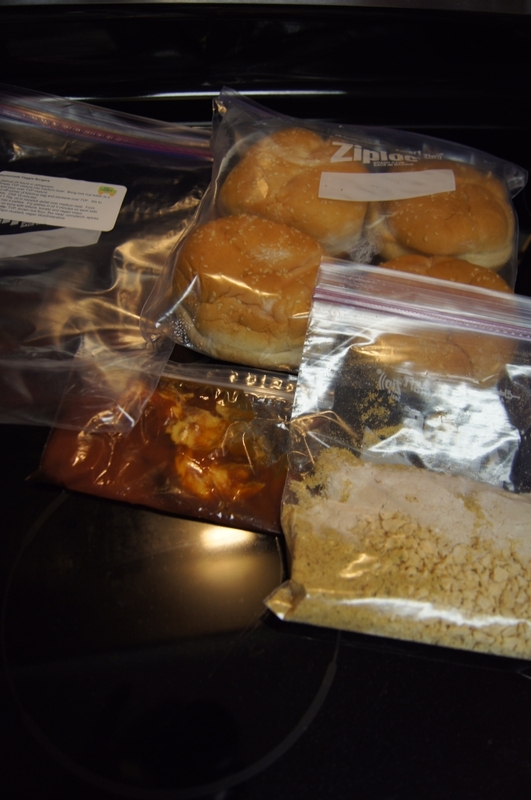 Maple Mustard Tempeh Sandwich - There's plenty of delicious tempeh under that. 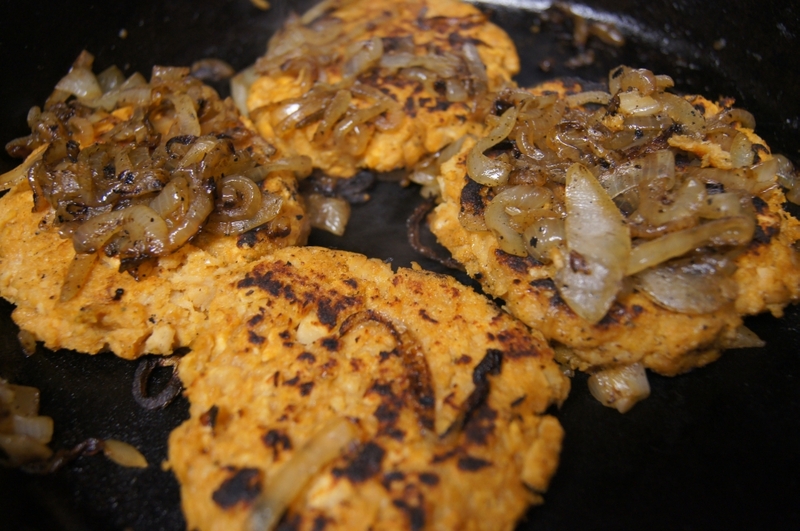 Korean Barbeque Seitan - A grilled tortilla stuffed with seitan, greens, kimchi and spicy vegan butter. If you find yourself in New York City and decide to search them out be sure to check their Twitter as they may not be in the same locations we found them. They’ve had some issues with the NYPD and parking lately that appears to be attributed to other trucks trying to tie up the limited space they find. Overcrowding seems to be an issue. Unfortunately, this would be our last visit to The Cinnamon Snail as New York City boasts many fine vegan food joints and we must get our eats on in variable fashion. 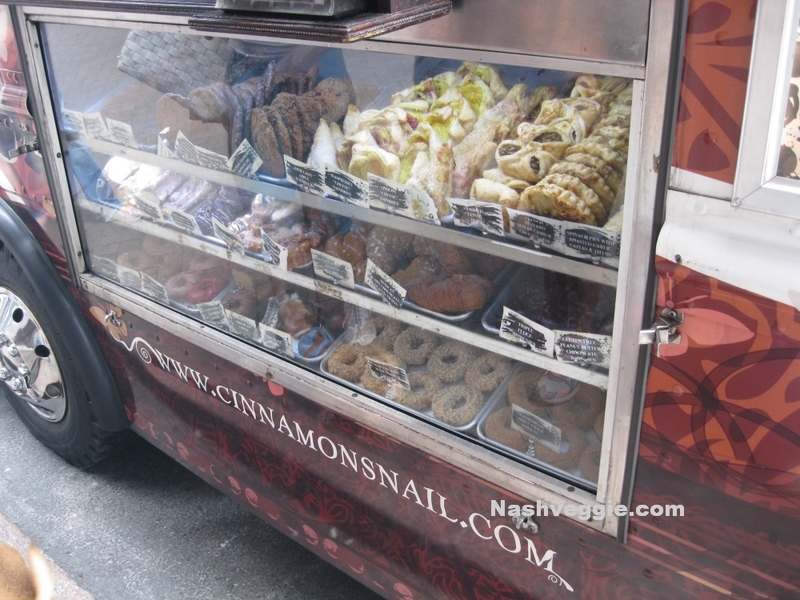 However, when we return to New York City, and we will return soon, I’ll be hitting the streets on the hunt for The Cinnamon Snail. I suggest you do the same.